Primulas are another great spring beauty. These amazing bright flowers are wonderful on their own or planted in spring combination planters with other spring flowers like tulips and daffodils. The cheerful, happy flowers are found in a dazzling variety of colours, combinations and hues ranging from white, pale yellow, soft pink to dark blues and reds. Primula is a genus that belong to the family Primulaceae. The primula that we see in spring is Primula vulgaris. Their Latin name refers to the fact that they are among the first flowers to bloom in spring. There are between four and five hundred different varieties of primula and they are mostly native to the temperate Northern hemisphere. If you’ve ever been to Britain in early spring, you might have seen them blooming in the hedge rows. In fact April 19th is celebrated as “Primrose day” in the United Kingdom. Primulas were an important plant in the past. They signified eternal love, youth and purity. They were sometimes used in love potions and magic potions. They were often used in treatment of paralysis, gout and rheumatism. Tinctures of primroses were used in treatment of insomnia, restlessness, headache and cough today. 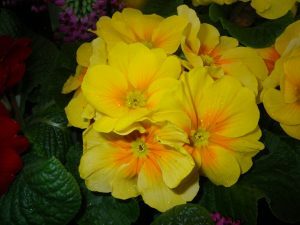 In the house, primulas like low light and it is important to keep them evenly moist. Many suffer from under watering. Carefully remove flowers as they finish blooming. If you keep watering the plants after the blooms are finished they can be planted in the garden in a damp, shady spot. But keep in mind that these delicate flowers won’t tolerate extreme summer temperatures or severe winters. They really should be treated as annuals. Enjoy them in their season and then move onto other spring flowers.